World Economic Forum in Davos, Switzerland is great place to country leaders to talk about future developments and economic problems of all mankind. On the other side, it is a good place to meet some new technologies and create great discussions about cryptocurrencies, blockchains and everything other connected to it. This video is a short debate about Bitcoin and gold, where two opposite sides talk about pros and cons of them. I am following for a while this guy, Davinci Jeremie, CEO Da Vinci Codes because of his very interesting prediction in the past. In the time when BTC was reaching it’s peak, he suggested to everyone to sold at least the part of it’s Bitcoin, because it will be a large drop after it. Somebody has listen to it, some not… Moreover, 6 months before of the Mt.Gox hack, Jeremie said in his video “do not leave money in there”. 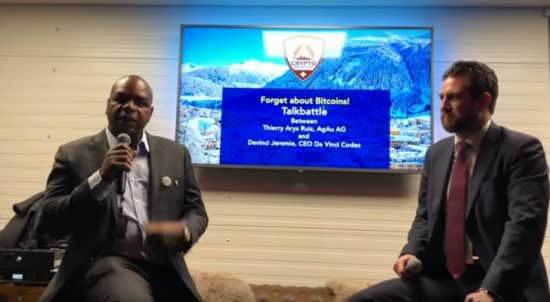 In this debate Jeremie has taken Bitcoin side against Thierry Arys Ruiz, CEO of AgAu AG. Thierry has created the blockchain-powered physical and allocated gold and silver-backed cryptocurrency tokens, so he was taking traditional gold (metal) side of the future.